In order to ensure optimal performance of the ecocure, the tow bar should be level to the ground. The ecocure should thus be connected to the hitch of the riding mower with the correct tow bar height. That is why there is an extensive series of heights provided for the tow bar. The lever to activate the top dresser can be adjusted to bring it within reach of the sitting position of the driver. A container fi lled with material to be spread (e.g. sand) represents a significant weight. In order to reduce pressure and resistance on the belt conveyor, one can place a grille in the container which helps to restrain the weight. Just behind the roller is an axle mounted with 32 spikes which prick through the top layer of the lawn’s soil to a maximum depth of 8 cm. This aeration roller consists of two parts. When making turns, there is a differential action between the spikes in the inner and outer turn. 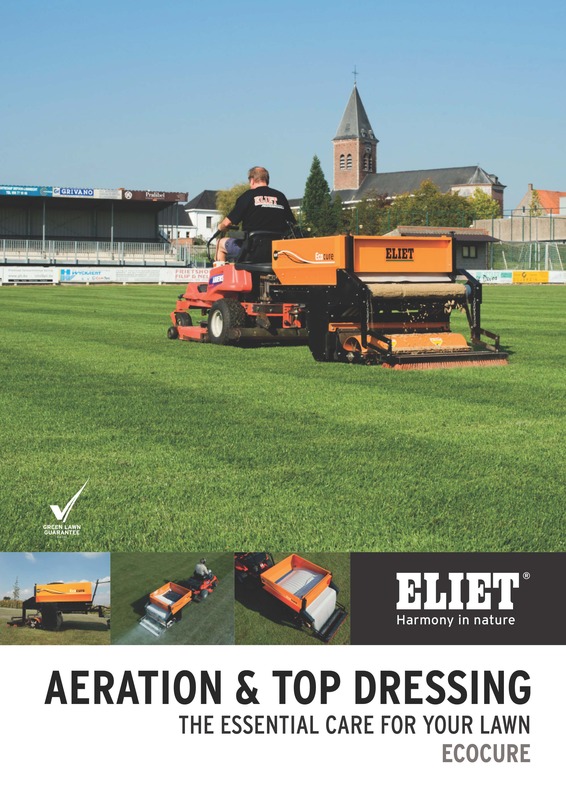 When top dressing a sports fi eld it is essential that the filler is evenly and equally distributed and that the correct fl ow of spreading material can be set. one must select the appropriate dosage supply of the ecocure in function of the characteristics of the material to be spread. With filling material such as sand, powdered lime, granulated lime, bloodmeal... one has particles of the same shape and size. In this case one selects the plastic guillotine slide to regulate the outflow opening. With irregular material to be spread, such as compost, there is a risk that large particles will clog the throughput opening. one can regulate the fl ow by means of the back plate which can be adjusted in height. There is a cam roller underneath this plate which crushes larger particles and pushes them through so that there is always an even throughput. The ecocure is drawn by a riding mower. All power trains branch off from the rotation of the roller by means of slowly rotating transmission (chains, gearwheels, belts) which hardly requires any maintenance. The purpose of the ecocure’s rubberized roller is to eliminate the unevenness of the lawn surface with the result being a turf as fl at as a pool table. furthermore, the roller provides an aesthetic striping pattern which gives the sports fi eld a professional and groomed appearance.